Take your game of Pandemic to the next level with these painted replacements for the original pawns. The bases are 16mm in diameter and the height of the figures ranges from about 40.25mm (the Researcher) to 46mm (the Operations Expert), including the base. The bases are separate from the pawns, allowing you to swap out colours as you like. The figures are also taller than the original pawns. Note that the bases and pawns are very similar in their circumference, making their footprints nearly identical on the board. 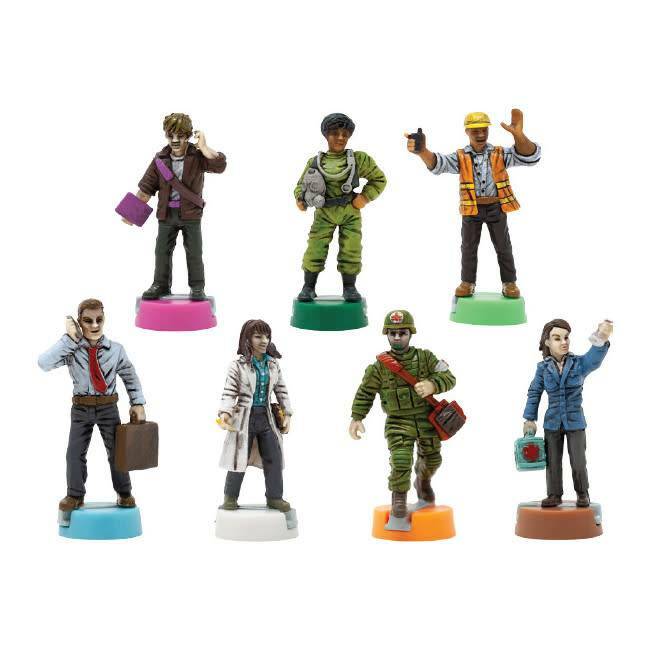 While the figures that come in Pandemic 10th are painted with an ink wash, these are fully painted figures that will really make your game pop! Celebrate the 10th anniversary of this beloved cooperative classic with this beautiful, vintage-inspired edition! This is an all-new expansion for the popular game Pandemic. You need to own Pandemic and Pandemic: On The Brink to play this expansion.